The Treasury just posted results of today’s reopening of CUSIP 912828WU0, which went off with a yield to maturity of 0.610%, plus inflation. Just before the auction closed, Reuters’ survey of primary dealers predicted a yield of 0.577%. Because this TIPS has a coupon rate of 0.125% based on its original July auction, buyers today are getting it at a substantial discount, about $95.72 per $100 of value. That is the adjusted price, which includes a very small amount of accrued inflation. 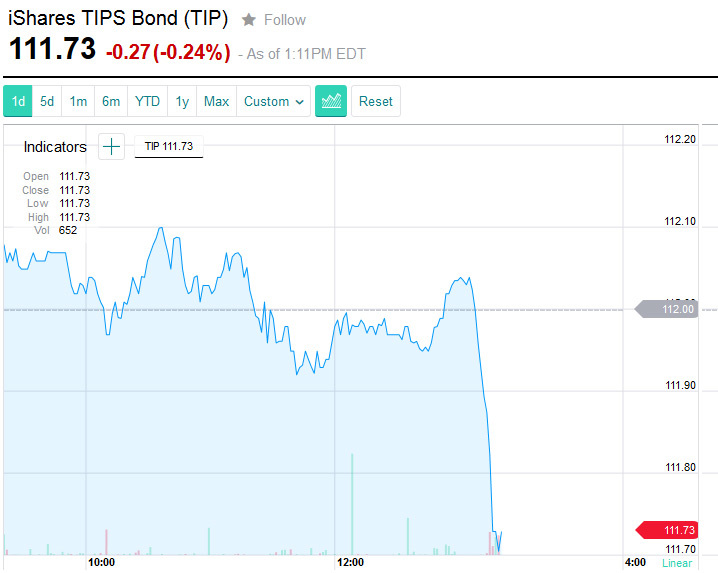 This is the biggest discount generated by any 9- to 10-year TIPS at auction since October 2008. 10-year inflation breakeven rate. With the 10-year traditional Treasury now trading at 2.63%, this sets up an inflation-breakeven rate of 2.02% for this TIPS. If inflation averages more than 2.02% over the next 10 years, this TIPS will outperform a traditional Treasury. When this TIPS first auctioned on July 24, it generated a yield of 0.249% and a breakeven rate of 2.26%. That’s an increase of 36 basis points in yield and a drop of 24 basis points in breakeven rate in two months. Today’s auction therefore was much more attractive for buyers, but the higher-than-expected yield also indicates lukewarm demand. Bloomberg’s story on the auction noted “the lowest demand since the financial crisis” for inflation-protected debt. While a 10-year TIPS is in the mid-range for maturity, yields on 5-year TIPS have also been rising at an impressive clip. The Treasury’s Real Yields page estimates a 5-year TIPS was yielding -0.07% on Sept. 2, and now is at 0.29%, a whopping 36-basis-point increase. TIPS of all maturities lost investors 2.7 percent in September, cutting their returns this year to 4.2 percent, according to Bank of America Merrill Lynch indexes. The securities lost investors 9.4 percent last year, according to the index.